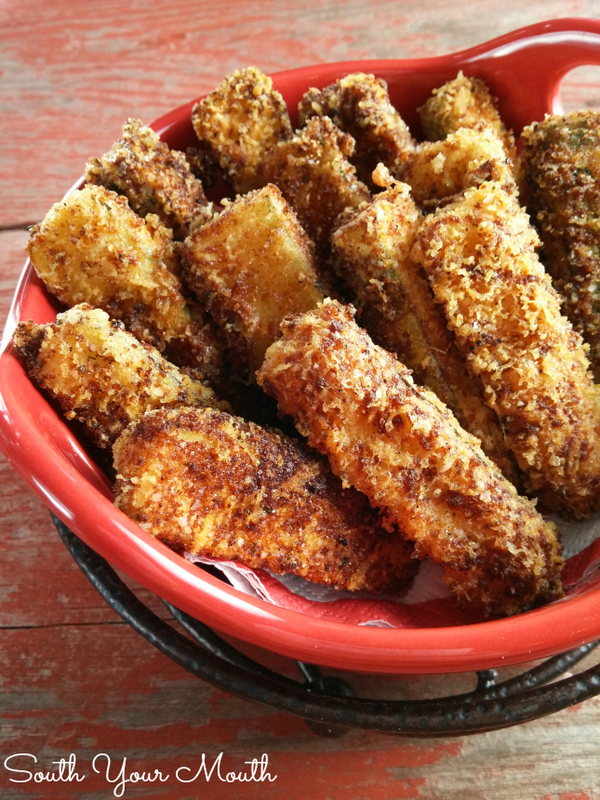 A delicious recipe for fried zucchini dredged in grated parmesan cheese and Italian bread crumbs then lightly fried in olive oil. You may be wondering where all the low carb and gluten free recipes are coming from. You may be my friend Colleen and totally call me out on it on Instagram. Ha! You may need to remember I have pictures from high school that would get you kicked out of your wine club. haHA! So, here’s the deal with that… I once read if you could buy all your groceries from the perimeter of the store and not shop in the aisles, you’d lose 700 pounds and win the lottery. Or something like that. But it is true that most of the whole, healthy, less processed foods are found on the perimeter of the stores: produce, meat, dairy and beer. Kidding about the beer. Just checking to see if you were paying attention. Y’all know I enjoy my share of easy, convenience items too! But I actually prefer the whole, real stuff better so I cook with it a lot too. And most of those around-the-perimeter foods are naturally gluten free. And you know what’s trending in social media right now? Gluten free! So I post stuff that just so happens to be gluten free on Instagram and hashtag the snot out of it. 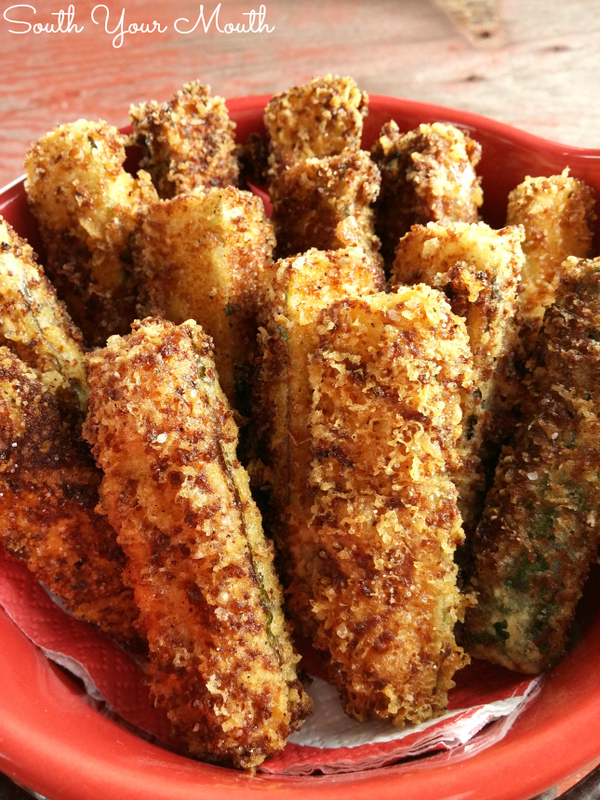 You can make fried zucchini just about any way you like. If you want to go gluten free or low carb, omit the breadcrumbs and double the cheese (my fav). If you don't want to use cheese, omit it and double up on the breadcrumbs. See my notes below for makes this recipe suit your fancy! I lovelovelove to make this when we have Italian food because I think it goes perfectly with it. And I love to dip these in marinara sauce! SO GOOD! It tastes a lot like mozzarella sticks but it's better for you! Wash zucchini and dry well. Cut ends off zucchini then cut each in half or thirds (depending on how long it is – you want sections that are about 3” long). Cut each section lengthwise into 8 spears. Add zucchini and cornstarch to a zip-top bag, seal then shake to coat. You can also do this in a lidded plastic bowl. Add zucchini to a plate, shaking off any excess cornstarch. Add eggs to a shallow bowl and beat well. Set aside. Add grated cheese, breadcrumbs and salt to a shallow bowl and mix well. Set aside. Add one inch of olive oil and/or vegetable oil to a medium or large pot. I use a combo of both if I’m serving these with Italian food; I use plain vegetable oil otherwise. Heat oil over medium heat until temperature is at 325 degrees. You want to fry these slowly so the zucchini has time to get tender without the cheese burning. Dip zucchini in egg and shake off any excess. Dredge zucchini in cheese/breadcrumb mixture taking care to thoroughly coat the zucchini; shake off any excess. Repeat with remaining pieces. Fry zucchini until golden brown. Cook in batches so not to overcrowd the pan. Sprinkle with coarse grain salt right when you remove the zucchini from the hot oil. Serve with marinara sauce or as-is. I love to make these when we have Italian food! *If you’d like to go gluten-free or low carb, omit the breadcrumbs! Simply double the amount of cheese and add one tablespoon of cornstarch. On the flip-side, if you’d like to omit the cheese, just double up on the breadcrumbs. Each zucchini yields about 2 servings. I made these tonight and they were delicious! I usually slice them in coins, but slicing them in spears is less labor intensive and look nicer. The only change I made was that I added salt to the cornstarch because zucchini is such a watery and mild vegetable. Thanks for the great recipe! Instead of bread crumbs can you used crushed pork rines and season them? I have used parmesan cheese instead of the bread crumbs and baked instead of frying. But, I am looking forward to trying your recipe. I also do the same thing with eggplant.. just peel the eggplant and cut in similar size pieces. My kids love it this way.